The 400 meter dash is a track event that combines speed, muscular strength and cardiovascular endurance. As a result, a specific training program must be used to meet the metabolic and physical demands of the event. To meet these demands, 400 meter sprint workouts focus on top speed, tempo training and stamina with an overall goal of developing technique, speed, strength and endurance. Repeat sprints can be customized to meet the specific demands of the 400 meter dash. Using short distances ranging from 120 to 200 meters, you run a series of sprints near top speed with a specific rest interval between each sprint. An example repeat sprint workouts starts with a total-body warmup followed by three to five sprints of 200 meters with a 60-second recovery between sprints. The goal of the workout is to maintain a high intensity level for every interval. Flying starts sprint workouts allow you to accelerate so you can focus on top-speed running mechanics. Start 10 meters behind the starting line for an acceleration zone so you cross the starting line at top speed. Continue for a distance of 50 to 100 meters at your 400 meter race pace. Rest for three minutes and repeat the flying starts for 10 rounds. 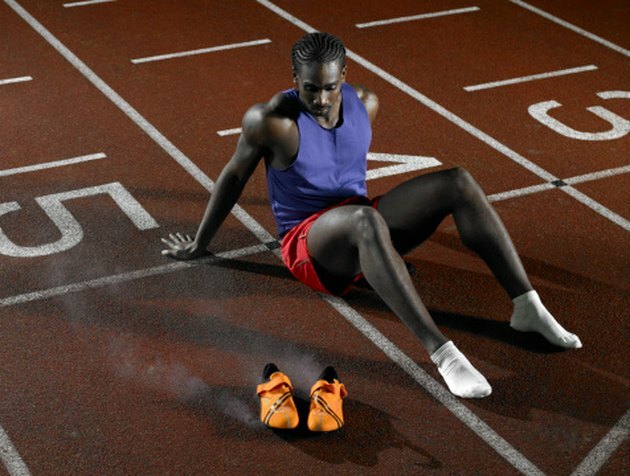 While the 400 meter dash is a sprint, you must have a specific tempo and rhythm to reach your best time. For a rhythm workout, start at the starting line and run 100 meters at your race pace, followed by a 50-meter jog for recovery. For example, if your race time is 52 seconds, aim to finish the 100 meter interval in 13 seconds. Immediately continue with another 100 meter interval at race pace, followed by another 50 meter jog recovery. Do seven repetitions of this cycle of 100 meters on and 50 meters off. Tabata intervals focus on speed, stamina and endurance. Sprint as far as possible for 20 seconds, followed by 10 seconds of rest for a total of eight rounds. The goal is to cover as much distance as possible during every sprint interval without reducing the distance in the later rounds. Use the last two rounds to work on your stamina and endurance to simulate the home stretch of a 400 meter race.